with a history dating back to 1944. Since its inception, the company has maintained a fundamental business strategy of creating products with unsurpassed design excellence, innovative functionality and durability. KING has a history of applying innovative technologies to develop specialty products. Originally, the focus was on the design and manufacturing of static signage and plastics. In 1964, KING designed the world’s first extruded aluminum sign system. KING releases “SmoothScroll”, a solid state electronic directory for large office buildings. KING pioneered the kiosk industry by engineering the MIKO kiosk based on Apple’s MAC computers. KING is awarded the MACUSER UK Award of excellence. KING patented several progressive kiosk designs. Awarded a contract from British Telecom to manufacture 1,000 multi-media web based “Multiphone” payphones. Launched Computerized Directory System (CDS), which combines a self-contained computerized information system and user-friendly software with a touch screen interface. Research & Development (R&D) department created to ensure that KING maintains as the world leader in complete solutions for multimedia interactive touch screen technology. KING is contracted by MTNL India and SingTel for pilot telephony kiosk projects. KING signed major contracts with prestigious telco companies including: Teléfonos de México (Telmex), Turk Telecom, Argentina Telecom, and Mauritius Telecom. Launched leading edge management software package - KINGNET™ - provides customers with the tools to operate and maintain a network of kiosks. KING emerges as the market leader in multi-media public terminals for the telecommunications sector by signing contracts with Bell Canada and Czech Telecom. ASP – Application Service Provider: KING provides KINGNET™ based on a monthly connection fee for companies managing network of kiosks. KING licenses its technology to other suppliers of non-competitive interactive devices. KING continues its breakthrough in the telecom sector signing new contracts with Bell Canada, Telmex USA, and Czech Telecom. Announces new successes on the Telco market. The company has been selected to supply multimedia terminals by the 2 largest telecom operators in Thailand and, in Malta, by MaltaCom. Awarded the contract to supply informational kiosks for the new Terminal 1 at Toronto’s Pearson International Airport. Products include the PLYNTH™ and LINK™ kiosks and a comprehensive software suite including KINGNET™ Management Server. Applications includes way-finding, flight information, VoIP telephony, and directories of local hotels and car rental companies. InComm, distributor of prepaid products and point-of-sale solutions, announced a new partnership with KING. The alliance enables InComm to provide retailers with self-service kiosks to offer prepaid wireless products and bill-payment services. KING custom-developed the kiosk hardware and software for InComm to address the need for a new flexible in-store purchase and payment solution for prepaid and bill payment products. PLYNTH™ G6 Series released, supports 2nd screens as standard feature along with a series of other peripherals. Awarded the contract to supply payphone terminals for Thailand’s Suvarnabhumi Airport, the world's second largest single building airport terminal. KING delivers 392 kiosks, each featuring an airport directory, VOIP pay telephony, and Internet access. The system includes a server suite managing all kiosks and transactions centrally. 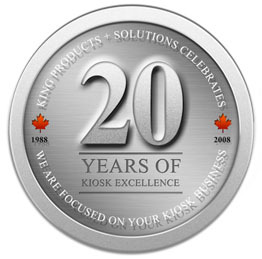 KING launches my-KIOSKS. The first total kiosk solution which combines a turnkey kiosk with a web-based approach to kiosk application creation, customization, integration and management. KING is awarded contract to supply kiosks for the ChamsAccess project in Nigeria. This is a rollout of 3000 self-service banking kiosks. Meridian Kiosks LLC aquires KING to create one of the largest end to end suppliers of self service solutions in North America.